As an up and coming discipline, Community Psychology has made its mark both in the applied field setting as well as through empirical research endeavors. However, there exists a clear divide between academic community psychologists and their practicing colleagues. In a field that focuses on bringing about positive change and strengthening communities, it appears as though the fundamental principles of this field have not been applied to those who practice it. Academics in this field established their power early in the development of Community Psychology. It was extremely important to progress this field with a strong research base to create a legitimate and respected reputation. Therefore, practicing community psychologists were not taken into considerationand drastically underrepresented members of the field during many conferences and trainings; on one specific occasion they weren’t even invited (Scott & Wolfe, 2015, p. 9)! Practicing Community Psychologists were not only invisible within their discipline but to the outside world as well. The label “Community Psychologist” was not used for practitioners, though their skill sets and education was one that filled this title. Therefore, peers and clients would not recognize practitioners as such, further hiding these applied community psychologists (Scott & Wolfe, 2015, p.11). It is quite a paradox; individuals who work hard towards empowerment, strength and change within communities remained invisible, weak and disconnected within their field. In recent years, with the growing popularity of Community Psychology as a discipline, practitioners were able to uncover niches within new settings which allowed them to more visibly apply the fundamentals of this field (Scott & Wolfe, 2015, p. 11). Also through developing a clear definition of community psychology practice and competencies by which to become a practitioner the once strained relationship between practitioners and academics was beginning to mend itself (Scott & Wolfe, 2015, p.20). Although this relationship has improved and both parties appear to have more equated value and stake within the field of community psychology, it is reasonable to assume that more work still needs to be done. The ever obvious difference between practitioners and academics is not only shown in how they contribute towards the field, but their perception of community psychology as a whole. It is understandable to assume that based on sheer differences in the types of roles you fill within a field, a gap between these roles will be created. Perhaps a phenomenon often discussed in the context of Clinical Psychology, egocentrism, could help explain and support this theory. “An egocentric bias occurs when one thinks of the world from one’s own point of view and self perceptiontoo much (“Self Perception,” para. 1).” Perhapsan already damaged relationship has been further strained by the presence of egocentric bias towards individual work, on behalf of both academic and practice Community Psychologists. It would be beneficial for both groups to play more of a role in each other’sspecialty, after all both academics and practitioners contribute greatly to the success of Community Psychology. Through collaboration, an appreciation for each other’s work could be achieved and the cycle of egocentric thought could be broken. There is more success found by working together than separately. Perhaps though the utilization of the principles of Community Psychology the “community” comprised of practitioners and academics can be strengthened and empowered as a single unit. How each group perceives the field of Community Psychology also plays a large role in the divide between these groups. Academics focus more on their empirical research, while practitioners actively apply the fundamentals of Community Psychology within the communities they aim to serve; of course there is a disconnect between them. How can academics provide strong empirical evidence for practices which they do not regularly experience? It seems like an impossible feat. Alternately, how can practitioners hope to apply research which can be disconnected from the specific community which they serve? 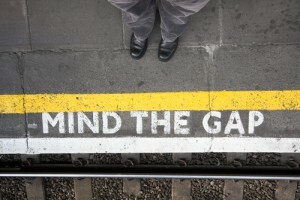 This gap is only hindering the advancements and successes of Community Psychology. It is important for both groups to actively engage with one another and involve each other in specific projects or experiences. Active involvement will help make research and interventions more effective and tailored towards a specific communities. 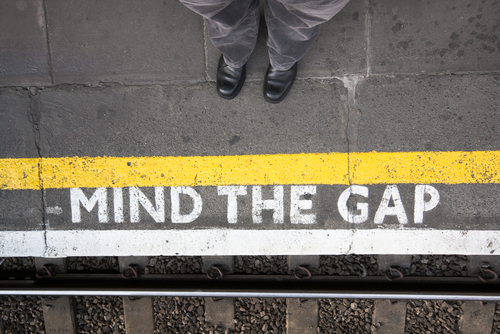 In terms of Community Psychology, it is important that we mind the gap between academics and practitioners, but also strive to close it. Emily Sullivan is a graduate student in the Autism Studies program at the University of Massachusetts. Scott, C. V, & Wolfe, M. S. (2015) Community Psychology Foundations For Practice. Thousand Oaks, California: SAGE Publications, Inc. In the following post, I will highlight the opportunities to complete a service term through various organizations such as the Peace Corps, Americorps, and Commonwealth Corps as viable options for gaining experiencing working in a community setting, and in laying the foundation for pursuing a career in community psychology. As a new Commonwealth Corps member beginning their year of service in the community, I am inspired to spread this opportunity to other aspiring community psychologists, and hope that it may lead some readers to consider service positions as a way to improve training and preparation for a career in the field of community work. Community psychology as a field is grounded in close collaboration and communication between community practitioners of various types, and academic groups leading research focused on strengthening communities through evidence supported means (Wolf and Scott 2015). As a result, community psychologists must have experience working in community health settingsas part of their education and training, and must approach their community work from a background in the foundational principles of the field. Service positions created by organizations such as the Peace Corps, Americorps, and the Commonwealth Corps for residents of Massachusetts, offer excellent opportunities to gain direct experience with community work, and professional development training that aligns with many of the focuses of Community Psychology for aspiring Community Psychologists. The importance of learning to adapt to the community members serve in andbuilding greater sociocultural and cross-cultural competence through close partnerships with community members and organizations. Striving to create sustainable change, in which an organization or community members are able to continue the benefits even after the term of service ends. Focus on empowering community members to gain access to available resources and achieve personal success. These three points are also reflected in the list of eighteen competencies presented by Victoria C. Scott and Susan M. Wolfe in Chapter 2 of their textbook Community Psychology: Foundations for Practice (2015), meant to outline the various skills desired for a successful community psychologist. In particular, Scott and Wolf (2015) list “Empowerment”, “Sociocultural and Cross-Cultural Competence”, and “Community Inclusion and Partnerships” as three of the five Foundational Principles of Community Psychology (Scott and Wolf, 44).Through a year of service, a person called to work in the community can gain crucial experience and professional development training grounded in thefoundational principles of community psychology,leading to later career opportunities in the field. For my year of service at the Boys & Girls Club of Greater Lowell, I am fulfilling the role of Teen Career Success Coordinator, and will be facilitating programs for teens focused on academic success, and preparation for college and careers. Over the course of my year of service, I will gain experience partnering with community members and organizations, andwill build upon my sociocultural and cross-cultural competency skills while serving to empower teens in the community of Lowell to pursue college and lay the foundation for achieving their career goals. Continuing my education in a Master of the Arts in Community Social Psychology program at UMass Lowellwhile serving in the community of Lowell will jointly provide a hugely beneficial experiential foundation for pursuing future opportunities in the field of community psychology. Increased partnerships between service organizations and university graduate programs in Community Psychology could help connect those looking to pursue a career in community psychology with a great opportunity to gain valuable experience, or connect alumni of service programs to higher education in community psychology to further their training.As a result, the field of Community Psychology gains well-trained and competent community psychologists, who then may put their skills to use to strengthen their various communities and improve well-being for all their members. As the field improves and matures, its ability to create positive change in communities across the world increases as well. To anyone interested in pursuing a career working in community psychology, I strongly recommend exploring options for committing to a service term in order to gain experience to pursue a career in community psychology work while giving back to your community. In addition, I argue for increased partnerships between service organizations such as the Peace Corps, Americorps, and Commonwealth Corps and university graduate programs in Community Psychology, in order to expand opportunities for those pursuing community work to gain first-hand experience and educational training. Such partnerships would strengthen the field as a whole, improving the positive effect it can have on communities across the world. Eric Johnson is a graduate student in the Community Social Psychology program at the University of Massachusetts. Scott, V. C., &Wolfe, S. M., (2015).Community Psychology: Foundations for practice.Sage Publications. Individuals working in the field of community psychology should approach their work, within a community, with different strategies and perspectives to gain a holistic understanding of the community they’re working with. One particular perspective is the ecological approach which allows the community psychologist to understand how the intricate ways of different parts of the community affect oneanother. Understanding the interdependence that each system has, and how each part of the system affects the other, can serve as a guide in determining practices and interventions that may be used or implemented to help serve the community. Having the broader perspective of a community allows for a community psychologist to identify the multiple parts, and relationships, within a social system that are in need of assistance and those that will be reinforced. Failing to have a broad view of the community could lead to key areas of the social system that are in need of assistance to be overlooked and neglected, which in turn will inadvertently lead to the interventions implemented to fail. An example of an ecological perspective offered by Scott & Wolff (2015), is the issue of global warming being caused by carbon dioxide. Looking at carbon dioxide as the sole reason for global warming fails to encompass the whole picture of the entire system that contributes to this problem. One needs to consider the effects that society imposes on the earth and adopt solutions that would incorporate the total social system to bring about changes that would lower carbon dioxide emissions to levels that would resolve the issue of global warming. Looking at the problem from just the standpoint of carbon dioxide levels being too high, fails to understand all the components that contribute to the problem and without considering those components, appropriate solutions to the problem will not be implemented. Develop an awareness of the social connection within a community and its members. Knowing how the community is interdependent on each other can help guide a community psychologist in working with the members and developing a working relationship that will lead to solutions to the community’s issues. Assuring that those in the community who have been disregarded by other members are given a voice and that they are “recycled” by being trained for their new roles in the community. Create feedback loops to help determine whether an intervention is working or not. Having these feedback loops helps give members of the community an opportunity to voice if the impact of the intervention is having a positive or negative effect within the community. Feedback loops help make a community more adaptable and sustainable (Scott & Wolfe, 2015). Encourage diversity within the community. Diversity offers many perspectives that help brainstorming solutions to resolve issues in the community. Promote a balanced leadership model by having an appropriate balance of hierarchal and communal processes (Stone & Wolfe, 2015). 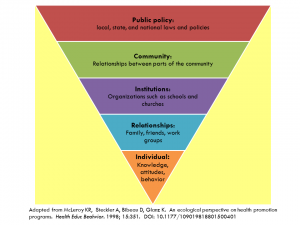 Community psychologists who incorporate these ideas into their practice will develop an ecological perspective that will help them acquire the ability to see the whole social structure that contributes to the issues of the community. Having this skill will better serve the community when confronted with issues that are in need of resolution and an ecological lens is needed to determine the solutions that will bring about positive change. Aimee Coombs is a graduate student in the Autism Studies program at the University of Massachusetts Lowell. Scott, V. & Wolfe, S.M. (2015). Community Psychology Foundations for Practice. United States of America: SAGE.